Normally, unless you fool around with the Paste Options, Excel 2016 copies all the information in the range of cells you selected: formatting, as well the formulas, text, and other values you enter. You can use the Paste Special command to specify which entries and formatting to use in the current paste operation. Many of the Paste Special options are also available on the Paste Options palette. To paste particular parts of a cell selection while discarding others, click the drop-down button that appears at the bottom of the Paste command button on the Ribbon’s Home tab. 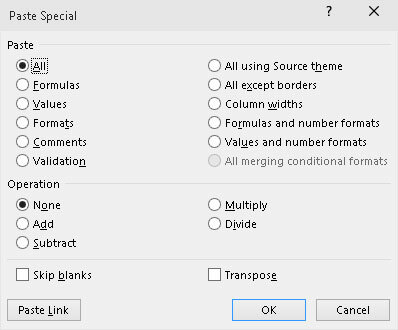 Then, click Paste Special on its drop-down menu to open the Paste Special dialog box, shown here. Use the options in the Paste Special dialog box to control what part of the copied cell selection to include in the paste operation. Formulas to paste all the text, numbers, and formulas in the current cell selection without their formatting. Values to convert formulas in the current cell selection to their calculated values. Formats to paste only the formatting from the current cell selection, leaving the cell entries in the dust. Comments to paste only the notes that you attach to their cells (kind of like electronic self-stick notes). Formulas and Number Formats to include the number formats assigned to the pasted values and formulas. Values and Number Formats to convert formulas to their calculated values and include the number formats you assign to all the pasted values.